I just started experimenting with iZotope’s Iris 2. Wow! Iris 2 wins the award for most improved virtual instrument for me in 2014! While Iris 1 focused on interesting ways to manipulate samples using photoshop-like editing to do spectral filtering along the timeline, it was lacking on the automation and sound shaping side for me. Things have certainly changed for the better in Iris 2! In this article I’ll offer a hands-on review of the new features, offer some tips, show you some early sound design experiment videos as well as offer first impressions on Iris2. There are plenty of Iris 1 reviews and videos out there so I’m not going to cover that ground. I also won’t cover the Spectogram editor either. I do offer some links to video tutorials at this bottom or the article if you want to see these features in action. In a nutshell, Iris is a sample-based synthesizer with four audio pool layers that can contain your own samples or samples from the factory library. 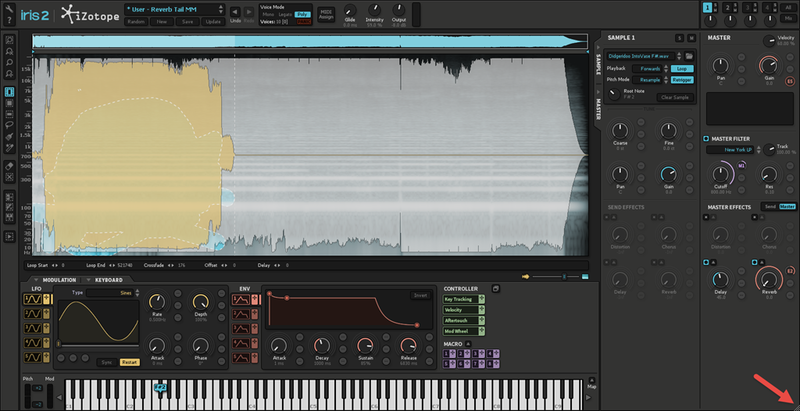 The spectrogram display allows you to manipulate edit the audio spectrum across the timeline. Iris 1 was released in April of 2012. Version 2 was released in November of 2014. You can play tune and play samples back like a classic sampler in various modes that allow you to play samples forward, revers, looped, and triggering one-shots. Radius-RT mode allows for real-time pitch shifting. In other words, in Radius-RT mode, playing the sample higher up the keyboard changes the samples pitch but not the speed as it would in the other modes. 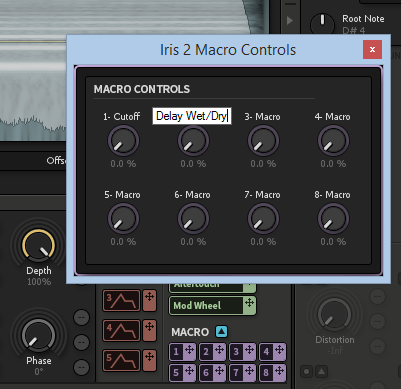 Iris 2 now has 5 LFOs, 5 ADSRs, 8 Macro knob mappings, MIDI mappings (mod wheel, aftertouch …). There are over 100 Modulatable parameters now! The new modulation system is killer with simple drag-n-drop style mapping (you can also use right-click). Once you drop you can scale the level of modulation on the target circle. A ring will also appear on the target allowing you to further manipulate depth. You get visual feedback in real-time as parameters are modulated. In the illustration above I mapped LFO2 and Macro Knob 1 to modulate LFO1s rate. You can also modulate the shape of an LFO. 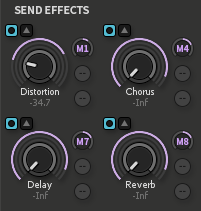 Tip: Envelope 5 is mapped to master gain by default making it the AMP ADSR. You can of course repurpose it, but go to ENV to make tweaks on factory presets. In addition to 4 master effects that were in Iris 1, there are now 4 insert effects per sample pool. All of the parameters can be modulate and automated. iZotope did a great job implementing this so there are little or no artifacts. Each effects unit has it’s own set of parameters with modulation targets to the right of the knobs. 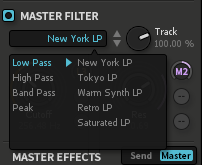 There is now a master filter – yay! There are no filters on the sample layers, but then again, the whole point of Iris’s unique spectral visual filter editing system is to allow you to create your own filters per sample. The master filter is just a nice touch for tweaking as well as performance. Also, you can create beat synced automation by modulating the Cutoff with an LFO to emulate gate-like effects. There are some gorgeous filter models here. 17 different filter ﬂavors, including classic analog Low-Pass and High-Pass filters as well as exotic Vocal Formant, Band Pass, and Peak filters from Trash 2. There is a new spectrum analyzer window that updates in real-time which is handy for sound design work. A Spectrum Analyzer is a meter that measures amplitude across the frequencies which encompass the spectrum of human hearing. The vertical axis represents amplitude while the horizontal axis represents frequency. The spectrum analyzer in Iris 2 displays frequencies from 20 Hz (at the far left) to 20,000 Hz (at the far right). and drag it to another part of your screen or to a different monitor! You can even undock the macro knobs and type in your own labels which is a nice touch. As with Iris1, Iris 2 has a built-in virtual keyboard including a pitch and mod wheel. I wish more developers would add this feature. I think it’s essential for sound design work so you can create from anywhere with or without a controller. Another essential features not all virtual instrument share is the ability to double-click on a parameter value and enter a numeric value without using a mouse. It’s just a time saver when you know what value you want to enter. Tip: If you hold the shift-click when you play a note on the virtual keyboard, that note (or set of notes) will remain on as if you were hitting a sustain pedal for those note. You can click on other notes and they will not effect the pinned keys. You can turn off individual sustained notes by doing a shift-clicking them. This is just fantastic for both sound design and playing using only your computer with no controller. Iris 1 had keybmapping to create splits and layers with the audio pools. I wanted to call that feature out in case you missed it in your Iris 1 use. If you want to do more fine editing on your waveforms or get more virtual keys on the screen while running Iris 2 from a host, you can drag the window and the sample windows scale. Stand-alone you can just resize the window. This existed in Iris 1, but again I wanted to mention it here in case you missed it. Another great features is the Patch Browser window can be detached. The macro controls are exposed in the patch browser window so you can preview and tweak – fantastic! You can also quickly see (and replace) what samples are in the sample pools. 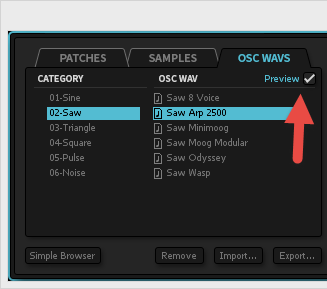 You can preview samples as well as OSC WAVS. Also, peppered throughout the interface there are solo and mute buttons. Pretty much anywhere you go in the interface you can toggle the audio pools to help you quickly adjust your creations. I recorded some videos of my first rounds of experiments with Iris 2. These videos will give you a real sense for all the real-time feedback offered by the new modulation system. Note I recorded these in mono, but you’ll get the idea. In this experiment I erase harmonics for the factory content OSC WAV “saw wave Arp 2500” then hammered the filter cutoff with rapid modulation. In the video above, I use the new OSC Waves feature to preview and load a square wave from a Moog Modular. I map LFO1 to course tuning. I map ENV 4 to modulate reverb wet/dry. I then set the speed of LFO1 to audio rates to get an FM sound. I map LFO2 to modulate the speed of LFO1. The end result sounds like something you'd get from a synth with modeled oscillators (of course Iris's master filter is modeled). I’ve only worked with Iris 2 for about 5 hours and I only just skimmed the manual (which was nicely laid out an well written). I was able to jump right in and start making patches as the interface is clear and intuitive, especially if you are coming from Iris1. The modulation system is familiar if you use other virtual synths on the market, so accessing these new ways to create expressive presets is easy work in Iris 2. As you can see from the videos above, the new workflow allows you to quickly and organically create your own signature sounds from samples. The new modulation system combined with the ability to have insert effects per pool AND being able to control parameters in real-time plus automate in real time elevates Iris 2 from a sound design tool to an expressive instrument. The morphable LFOs that can run at audio rates, plus the addition of the master modeled filter, and the included OSC WAV content, means you can also use Iris 2 to quickly get into the realm of classic synths. Or better yet combine one of those huge bass factory samples with a field recording to create a sonic landscape that would not be possible on a classic synth. 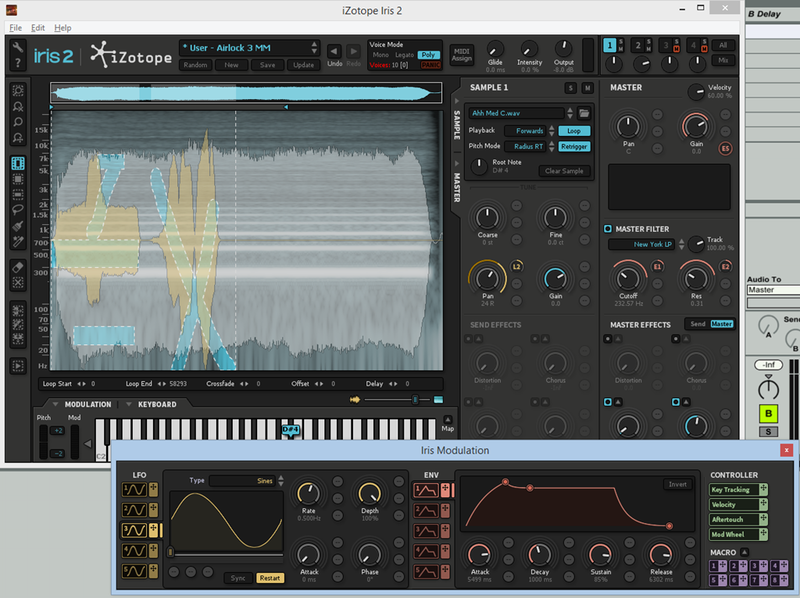 The audio engine sounds great to my ears which is I suppose no surprise since it’s iZotope. More importantly – Iris doesn’t really have a “sound”. Instead it sounds like the sound designer – which is really fantastic if you want to make signature patches. Sure you could color your creation with a master filter or use that filter for global rhythmic effects – but you don’t have to. You could instead carve out all the harmonics yourself Spectogram. All this awesomeness comes at a price though. Iris 2 is one of the most CPU heavy instruments I’ve used – as in U-HE ACE & Bazille heavy. As with the U-HE synths I think it’s really worth it though. The sound is gorgeous and the interactive feedback while designing and performing is pretty fantastic. You can of course lighten your load if you plan ahead. P. 70 of the manual has a whole variety of tips to lighten the load including lowering voice count, lowering sample bit rate, don’t use the Radius RT algorithm if you don’t need it, and reduce sample distance from original pitch (The further away from the root note you get, the higher the impact on CPU performance). Another use case for Iris is to become sources for other live performance instruments. For example, you could sculpt sounds in Iris 2 then make them Octatrack food. My testing was done on an HP Envy Touchsmart 15 laptop. While fine editing of parameters isn’t possible on a touchscreen of this nature, you certainly can easily draw and grab and drag spectrum segments in the Spectogram editor – woot ! That should be fun for live performance with Iris 2. I emailed iZotope to comment on the CPU load and they were quite responsive and transparent about what’s coming next. They indicated they are aware of the CPU load and are working on incremental updates to improve things further. They also mentioned there will be improvements to Iris 1 to Iris 2 patch translation coming soon (something I did not test). Fixed AU validation issue on OS X El Capitan. Fixed an issue with dialog boxes not showing on OS X El Capitan. Addressed an issue with patch translation between Iris 1 and Iris 2 (read more here). Addressed an issue with saving of translated patches. Addressed an issue with amplitude envelopes. Addressed an issue with MIDI CC assignment. Envelope curve adjustments have been optimized for refined control. New LFO Wavetables with Iris 1 legacy waveshapes are included. So if you loved Iris 1 you’ll REALLY love Iris 2. If Iris 1 fell short, you really owe it to yourself to give it another try (demo link below). For studio use, Iris is worth a look if you are interested in creating your own signature sounds from sampled sources, or quickly tweaking the massive 11GB factory library to do your bidding. It’s a no-brainer choice for those into music concrète. Seasoned sound designers will really enjoy the Spectogram editor and new modulation system. For live use you’ll need a beefy computer – but I already see some fun potential uses in performance. For example you could do on-the-fly spectrum filtering as well as manipulate filter segments in Spectogram in real-time to change the timbre of audio pools. Izotopie’s planned incremental improvements should continue to ease CPU load and I predict more and more artists will end up using Iris 2 in Performance as well as in the studio. Iris 2 is a creative sampling tool. It is not the be-all end-all sampling solution – say like Komplete. What it does, it does REALLY well. Some things it does are quite unique – or – the same task would take you much longer to do with a more traditional workflow. Many users could get by with nothing but Iris 2. I see advanced users leveraging Iris 2 as a compliment to other instruments such as Absynth. Iris 2 is $299 and currently on sale for $199 through December 31st 2014. The upgrade from Iris 1 is $99 till December 31st then goes up to $149. While the pricing is on the higher end of the spectrum as virtual instruments, there is a lot packed into Iris 2. It seems like a good value when you consider your getting a visual spectral editor, sample synthesizer, and high-quality iZotope effects all in one virtual box. For me, working with Iris 2 is incredibly inspiring! The brilliant user interface and rich features not only allow you to create and shape sounds in a predictable way – but also can result in fun surprises that can take you in new creative directions. The included 11GB of content and example factory patches also allow you to get going right away and offer some content that might be hard for you to create or grab with your field recorder – such as vintage synth samples. For me the difference between Iris 1 and 2 are night and day. Where Iris 1 seemed like an innovative audio editor, Iris 2 now feels like a full-on instrument where effects are baked into your presets. Bravo iZotope! This is an incredible improvement over Iris 1. Iris 2 is now on my short list of instruments for creating signature sounds in 2015!